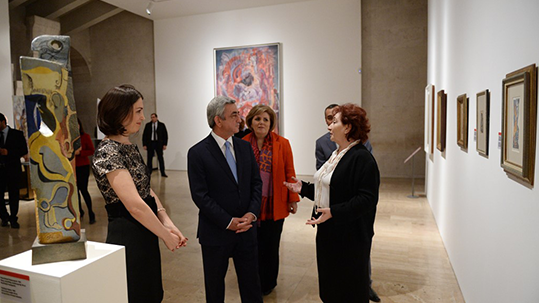 On December 10 the President of the Republic of Armenia Serzh Sargsyan visited the Cafesjian Center for the Arts to view the exhibition Kochar: Challenging the Timededicated to the 115th birthday anniversary of renowned Armenian artist Ervand Kochar. The exhibition has been organized in partnership with the Ervand Kochar Museum as part of the Center’s Inter-museum cooperation project. Featuring thirty works from the Ervand Kochar Museum and private collections, the exhibition brings together a brilliant selection of works including masterpieces from Kochar’s Paris and Yerevan periods: painting, graphic works, sculptures and his groundbreaking form of plastic art painting in space.